Shermaine Barrett (PhD) is a Senior -Lecturer at the University of Technology, Jamaica. She currently serves as Vice President for the Caribbean Region of the International Council for Adult Education (ICAE) and President of the Jamaican Council for Adult Education (JACAE). Her research interests include adult teaching and learning, workforce education, and teacher professional development. Abstract – How can we build the capacity of adult educators to create inclusive classes within the context of student diversity? This article outlines a process through which adult educators can develop a better understanding of themselves in terms of their values, moral perspective, biases and prejudices and identify how these traits influence their interactions with their students. The assumption is that reflexivity, the willingness to self-reflect, enables instructor self-knowledge, which leads to better self-management and context management, resulting in turn in being ­better able to create an inclusive learning environment. Living in an ever-changing and connected global world, diversity has increasingly become a hot topic in political, legal, corporate and educational arenas. As a concept, diversity acknowledges that people differ in many ways, some visible, some invisible. Typical examples include age, gender, marital status, social status, disability, sexual orientation, religion, personality, ethnicity and culture. Gardenswartz and Rowe (2003) categorise these multiple dimensions of diversity in what is called the Four Layers of Diversity model. In this model, the four layers are depicted as four concentric circles. Moving from the centre outward, these layers consist of personality in the centre, internal dimensions in the second circle, external dimensions in the third circle, and lastly organisational dimensions in the fourth and outer circle. The personality dimension relates to the individual’s personal style and characteristics, which speaks to whether an individual is an introvert or extrovert, reflective or expressive, a thinker or a doer. In the second layer, the internal dimensions speak to those characteristics over which the individual has no control. These include characteristics such as gender, age, race, sexual orientation, ethnicity and physical ability. In the third layer, the external dimensions comprise those aspects that are the result of life experiences and choices such as religion, educational background, work experience, parental status, marital status, recreational habits, geographic location and income. The fourth layer, the organisational layer, consists of characteristics such as work content/field, management status, union affiliation, seniority, work location, divisional department, and functional level classification. The characteristics of diversity associated with this layer are items under the control of the organisation in which one works. All the dimensions discussed by Gardenswartz and Rowe (2003) are important in adult education. Wherever in the world we are, the issue of diversity is central to the adult learning classroom. Such classrooms comprise a range of ages, multitude of beliefs, understandings, values, ways of viewing the world, as well as the diverse experiences of the participants. In some regions, the issue of diversity is further compounded by the recent spate of mass migration as people flee political and social unrest in their homelands to seek protection and assistance in other countries. These people will need education and training on many levels as they seek to integrate into their host countries. Adult education is also usually associated with efforts to address issues that people face in their communities – for example issues of poverty, ill health, crime and violence, political disempowerment, exclusion of individuals based on gender, class and other factors, the need for work skills, and environmental degradation. The role of education is therefore twofold. It should lead to a better, more fulfilling personal life, but at the same time should result in a better citizenry and a better world. For that to work, learners must be empowered and included. Learning is therefore best facilitated in a context of mutuality and respect in which participants feel valued. A typical trait in adult education is that a high degree of participation is expected from everybody. This includes learners taking responsibility for their learning and engaging in open and authentic dialogue within the learning environments. Within the classroom, healthy forms of communication and freedom to critique and choose is facilitated, and students’ initiative and autonomy are promoted (Barrett 2012). Given the context and the goal of adult education, adult educators should actively manage and value the diversity within their learning spaces to ensure that learners feel included within the learning environment. The adult educator has to move from simply acknowledging and accepting that individual learners are different, to a position where he or she creates an atmosphere of inclusion. The key to creating an inclusive classroom that encourages participation, teamwork, and cohesiveness is diversity management which encourages persons to interact and share ideas. Instructor competence in creating inclusive classrooms through diversity management is of vital importance here. Let us now take a closer look at a number of strategies that will help adult educators develop the competencies to create inclusive classrooms. Our starting point is that educators who develop a reflexive practice are best able to create inclusive classrooms where participants feel respected, their views are honoured and therefore they feel free to participate. Reflexivity refers to the teacher’s willingness to explicitly examine how his/her assumptions, personal beliefs, and dispositions impact his/her attitude towards teaching and students and their consequent willingness to look at things from a different perspective (Barrett 2012). Reflexivity requires the individual to think more critically about their actions and to question how they see their world. It gives focus to the presuppositions, assumptions, values, personal philosophies, the things we take for granted and their impact on our relationships. This form of reflection is identified by Mezirow as premise reflection, that is, reflection on questions about why we behave the way we do; “what is it about the way we see other people that compels us to make polarised, summary value judgments” (Mezirow in Welton 1995: 45). The practice of reflexivity involves questioning the relationship between one’s self and others (Cunliffe 2004). It exposes contradictions, doubts, dilemmas and possibilities (Hardy & Palmer 1999). Reflexivity, with its focus on self-reflection, has profound potential for major personal transformation at the level of what Mezirow (1997) describes as the transformation of one’s meaning perspectives. Reflexivity may be seen as one aspect of the larger field of reflection, and as such may be viewed as progression along a continuum, moving from reflection on action and in action (Dewey 1933; Schon 1983), to critical reflection (Stephen Brookfield 1995), and then to reflexivity or transformational learning (Mezirow 2000). (See figure 1). A reflexive practice requires that the instructor engages in reflection at various stages of his or her practice. The literature on teacher reflection speaks to reflection before, during and after instruction. 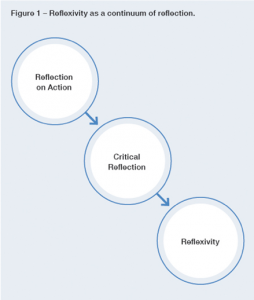 Dewey (1933), Schon (1983) and Laughran (2005) all spoke to reflection from the perspective of timing when they referred to reflection as reflection-for-action; reflection-in-action and reflection-on-action. Reflection-on-action (Dewey 1933; Schon 1983) refers to looking at situations retrospectively and seeking to see how they could have been done differently. It entails a systematic and deliberate process of thinking about one’s actions after an event. Reflection-in-action refers to thinking about doing something while doing it. This type of reflection may be described as thinking on your feet. It occurs when an individual reshapes what he or she is doing while doing it. Mezirow (1995) described reflection-in-action as the momentary kind of reflection that is used in an immediate situation to guide next steps. Key to reflection-in-action is past experiences that allow one to recognise the kind of response that a particular action is likely to evoke, leading to a modification of one’s actions. This type of reflection can be aligned with the notion of self-management promoted in the literature on emotional intelligence. Reflection-for-action is anticipatory in nature. This refers to reflection that takes place prior to an experience, and as such may be described as reflection for action. The focus of this form of reflection is self-awareness, another central notion of emotional intelligence. 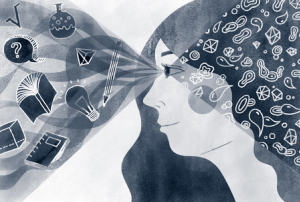 Creating inclusive adult classrooms requires that the instructor engages in reflexive practices before, during and after the learning experience. Teaching in contemporary societies takes place in complex and diverse settings. Nowhere is this truer than in the adult learning classroom, given the heterogeneity of those classrooms. The educator can be called a teacher, tutor, facilitator, or guide. Regardless of the title, he or she needs to create and manage a classroom environment that facilitates all students’ learning. What the educator does or does not do is of great importance in facilitating learning. At the same time, the nature and outcomes of our behaviours as teachers are largely impacted by our intellectual assumptions, beliefs and emotions. Teachers respond to students based on their thoughts, worldview, values and assumptions. Thus, sometimes “what we think are democratic, respectful ways of treating people can be experienced by them as oppressive and constraining” (Brookfield 1995: 1). Reflexivity provides a tool that makes teachers aware of the lenses they wear as they teach and through which they view their classrooms. But it also acts as a mirror that enables the teacher to view him or herself and to make explicit that which is tacit or taken for granted. In so doing, being reflexive helps teachers to clarify and redefine their educational beliefs, images, and assumptions, and enables them to see how their conclusions about events in their classrooms are really just their interpretations of such interactions. The reflexive process enables teachers to integrate their professional beliefs and theoretical knowledge into new professional meanings and concrete practices for the benefit of creating and maintaining inclusive classrooms and to ensure student learning. Village and Lucas (2002) observed that teachers are better able to create a more effective communication with their students when they know their students’ cultures, confront their own prejudices and behave unbiasedly. Reflexivity therefore facilitates the development of the teacher’s personal and social competence – emotional intelligence – and facilitates transformative teacher growth. This helps the teacher to be less emotional in the classroom, thus creating a friendlier learning environment. Teaching adult educators to be reflexive begins with instructors clarifying their core values, developing a vision, and consciously aligning their attitudes and beliefs with their actions and behaviour. Avery and Thomas (2004) noted that courses that mainly lecture with little learner interaction and experiential learning are unlikely to increase diversity awareness. Active engagement and experiential activities help learners make the transition from cognitive knowledge of concepts to a more thorough understanding and practical applications. Consequently, the strategies to promote reflexivity in adult educators presented here are fundamentally experiential and participatory. The strategies are theoretically grounded in the ideas of critical reflection (Freire 1995), transformational learning (Mezirow 1997), experiential learning (Kolb 1984; Jarvis 2010), social constructivism (Vygotsky 1978) and reflective practice (Brookfield 1995; Loughran 2005; Mezirow 1997). The four strategies presented are recommended for use in either a pre-service instructor training context, or in-service instructor training. All the strategies allow instructors in training to actively participate in structured learning experiences, either individually or in groups. These strategies create learning experiences, either real or simulated, to facilitate the individualʼs own self reflection/introspection. The aim therefore is not to directly teach, but to allow the instructors as learners to discover information about themselves through self-reflection and group interaction. In the sections that follow, the adult educator in training will be referred to as the trainee, and the teacher will be referred to as the instructor. Journals are tools that promote growth among trainees through critical reflection and meaning making. The goal of journal writing is for students to evaluate their actions and reflect on how they could handle a situation differently in the future – reflection-on-action. But it also facilitates reflection-for-action, as the result of the analysis will inform future actions. Journal writing provides a safe place for free expression of thoughts and feelings. Reflective journaling provides guided opportunities for learners to “think aloud” on paper and reflect on their own perceptions or understandings of the situations encountered (Brown and Sorrell 1993). Trainees are able to describe why decisions were made and actions taken, along with feelings and future thoughts and directions. As a strategy for teaching reflexivity, trainees would document incidents in which they recall being challenged by a student or a differing view, or feeling uncomfortable or angry within the learning space. They would be asked to analyse their responses within those situations. The instructor would then provide one-on-one feedback to the trainee about their journal entry. The feedback should be devoid of judgment and criticism. Rather, feedback should serve to challenge the trainee to reflect on his or her experiences and to push the trainee to reflect more deeply at the level of their assumptions, presumption and beliefs about him or herself, their learners and the learning environment. This includes pushing trainees to continuously ask themselves why a decision was made or why they feel the way they do about a topic or a situation. To be effective, the journal writing process should be well planned and have explicit student expectations. Additionally, trainees will need to be open-minded and willing to take responsibility for their actions in the various incidents recorded. The aim here is to expose biases, prejudices and personal concerns. The effectiveness of this approach rests on the willingness of the trainees to be open to rethinking their assumptions and to subject those assumptions to a continuous process of questioning, argument and counter argument. The adult educator in training also needs to be objective in presenting and assessing reasons for positions and reviewing the evidence and arguments for and against the particular problematic assertion. The point here is not to arrive at a consensus, but rather to help trainees reach a more critically informed understanding of the problem, to enhance their self- awareness and their capacity for self-critique, to help trainees to recognise and investigate their assumptions, to foster an appreciation among trainees for the diversity of opinions and perspective that emerge within the context of open and honest discussion, to encourage attentive and respectful listening, and to help individuals to take informed decisions (Brookfield & Preskill 1999). The instructor would put forward a problematic statement arising from either a real-life situation or a fictitious situation related to some aspect of diversity. The instructor would then facilitate an open discussion on the issue. The trainees would be encouraged to be objective in presenting their arguments and open to reviewing the evidence and arguments provided by their fellow trainees for and against the statement being discussed. Through the critical discussion, trainees will become aware of their assumptions and perspectives on the issue discussed and how these may differ from those of others. The use of scenarios and role playing can also be valuable in facilitating the development of reflexivity in adult educators. In general, role playing accelerates the acquisition of know-ledge, skills and attitudes by focusing on active participation and sensitisation to new roles and behaviours. The opportunity to engage in situations that are similar to real life helps trainees to practice and retain information, and enables the transfer of knowledge and skills to everyday life (Dawson, n.d.). Providing trainees with realistic diversity scenarios will help them develop an understanding of the complexity of diversity issues by taking on the perspective of another. Role play can also be used to have trainees demonstrate how one would respond in a given situation and to assess the reasons for such responses. In the classroom, trainees are presented with real-life scenarios depicting a classroom problem, and they are asked to act out the situation responding to the embedded challenge. Following the role play, the instructor would facilitate a discussion about what was enacted by the trainees and the decisions they made in addressing the challenge. This process of reflection presents another avenue for self-know-ledge, reflection-for-action. This strategy is close in nature to the group discussion approach discussed earlier. This is because the case usually serves as a catalyst for an open group discussion. Case studies are useful in helping individuals to analyse their values on various social issues involving many people and varying viewpoints. Case studies are used to demonstrate different ways of thinking about the same issue. As a strategy for encouraging reflexivity, the instructor would select cases adopted from actual situations, either independently or in collaboration with the trainees, reflecting diversity scenarios. Trainees would be required to read the case and independently articulate their own response. Then the instructor would facilitate a discussion around the case during which trainees would have the opportunity to share their perspectives on the matter. The discussion around the case allows trainees to expose and reflect on the lens through which they view various diversity-related issues. It also helps them to clarify their beliefs, assumptions, biases and contradictions. Today’s world is characterised by internationalisation, globalisation and increased levels of migration. As a result, the issue of diversity has gained in importance within our societies and, importantly, in our learning spaces. Adult educators must develop skills and competencies to manage diversity in their classrooms and to create a learning environment in which all learners feel respected and are therefore willing to participate. The adult educator should develop an appreciation of the need to constantly examine his or her assumptions, personal beliefs and dispositions, and to have an increased awareness of how the resulting behaviours and attitudes play out in their classes. This puts the educator in a better position to create and maintain more inclusive classrooms. Avery, D. R. & Thomas, K. M. (2004): Blending content and contact: The roles of diversity curriculum and campus heterogeneity in fostering diversity management competency. Academy of Management Learning & Education, 3(4), 380–396. Barrett, S. (2012): Teaching beyond the technical paradigm: A holistic approach to tertiary professional education. In: Journal of Education and Development in the Caribbean, 14(2), 1–18. Brookfield, S. D. (1995): Becoming a critically reflective teacher. San Francisco, CA: Jossey- Bass Publishers. Brookfield, S. D. & Preskill, S. (2005): Discussion as a way of teaching: Tools and techniques for democratic classrooms (2nd ed.). San Francisco, CA: Jossey-Bass Publishers. Brown, H. N. & Sorrell, J. M. (1993): Use of clinical journals to enhance critical thinking. In: Nurse Educator, 18(5), 16–19. Cunliffe, A. (2004): On becoming a critically reflexive practitioner. In: Journal of Management Education, 28(4), 407–426. Darkenwald, G. G. & Merriam, S. B. (1982): Adult Education: Foundations of Practice. New York, NY: Harper and Row. Davies, E. (1995): Reflective practice: a focus for caring. In: Journal of Nursing Education, 34(4), 167–174. Dawson, G. A. (n.d.): Integrating emotional intelligence training into teaching diversity. Business Quest. Dewey, J. (1933): How we think. New York, NY: Heath and Co.
Freire, P. (1995): Pedagogy of hope. New York, NY: The Continuum Publishing. Hardy, C. & Palmer, I. (1999): Pedagogical practice and postmodernist ideas. In: Journal of Management Education, 23 (4), 377–395. Jarvis, P. (2010): Adult Education and Lifelong Learning: Theory and Practice (4th ed.). Oxon, OX: Routledge. Kolb, D. A. (1984): Experiential Learning. New Jersey, NJ: Prentice Hall. Laughran, J. (2005): Developing reflective practice: Learning about teaching and learning through modeling. London, England: RoutledgeFalmer. Mezirow, J. (1995): Transformation theory of adult learning. In: Welton, M. (ed. ): In defense of the lifeworld: Critical perspectives on adult learning, 39–70. Albany, NY: State University of New York Press. Mezirow, J. (1997): Transformative Learning: Theory to Practice. In: New Directions for Adult and Continuing Education, 74, 5–12. Schon, D. A. (1983): The reflective practitioner: How professionals think in action. New York NY: Basic Books. Villegas, A. M. & Lucas, T. (2002): Preparing culturally responsive teachers: Rethinking the curriculum. In: Journal of Teacher Education, 53(1), 20– 32. Vygotsky, L. S. (1978): Mind in society: The development of higher psychological processes. Cambridge, MA: Harvard University Press. Shermaine Barrett (PhD) es profesora titular en la Universidad Tecnológica de Jamaica. En la actualidad ocupa el cargo de vicepresidenta para la región del Caribe del Consejo Internacional de Educación de Adultos (International Council for Adult Education – ICAE). Entre sus áreas de interés en la investigación se incluyen la enseñanza y el aprendizaje de adultos, la educación del personal y la formación profesional de los docentes. Resumen – ¿Cómo podemos desarrollar las capacidades de los educadores de adultos a fin de crear clases inclusivas teniendo en cuenta la diversidad del alumnado? En este artículo se describe un proceso gracias al cual los educadores de adultos podrán llegar a comprenderse mejor a sí mismos en cuanto a sus valores, su perspectiva moral, sus sesgos y prejuicios, y además serán capaces de identificar la manera en que estos rasgos influyen en su interacción con los alumnos. La premisa es que la reflexividad, la disposición para la autorreflexión, permite que el docente se conozca a sí mismo, lo que se traduce en un manejo más eficaz de las propias emociones y del contexto, y al mismo tiempo mejora su aptitud para crear un ambiente de aprendizaje inclusivo. Debido a que vivimos en un mundo globalizado, conectado y en permanente cambio, la diversidad se ha transformado progresivamente en un tema candente en los ámbitos político, jurídico, empresarial y educativo. Como concepto, la diversidad reconoce que las personas difieren entre sí de muchas maneras, algunas visibles y otras imperceptibles. Entre los ejemplos típicos se incluyen la edad, el género, el estado civil, la condición social, la discapacidad, la orientación sexual, la religión, la personalidad, el origen étnico y la cultura. Gardenswartz y Rowe (2003) clasifican estas numerosas dimensiones de la diversidad en lo que se conoce como modelo los Cuatro Estratos de Diversidad. En este modelo, los cuatro estratos están representados como cuatro círculos concéntricos. Desde el centro hacia afuera, estos estratos consisten en la personalidad en el centro, las dimensiones internas en el segundo círculo, las dimensiones externas en el tercer círculo, y por último las dimensiones organizativas en el cuarto círculo, que es el externo. La dimensión de la personalidad se relaciona con el estilo y las características personales del individuo, que revelan si es introvertido o extrovertido, reflexivo o expresivo, un pensador o un ejecutor. El segundo estrato, el de las dimensiones internas, nos habla de las características sobre las que el individuo no tiene control. Entre ellas se incluyen el género, la edad, la raza, la orientación sexual, el origen étnico y las capacidades físicas. El tercer estrato, el de las dimensiones externas, comprende aquellos aspectos que son resultado de las experiencias y opciones de vida, como la religión, la formación académica, la experiencia laboral, el hecho de ser o no madre o padre de familia, el estado civil, los hábitos recreativos, la ubicación geográfica y los ingresos percibidos. El cuarto estrato, el organizativo, consta de características como el contenido y el ámbito del trabajo, la posición administrativa, la afiliación sindical, la antigüedad en el cargo, el lugar de trabajo, el departamento divisional y clasificación de nivel funcional. Las características de diversidad asociadas a este estrato son aspectos que están controlados por la organización en la que se trabaja. Todas las dimensiones analizadas por Gardenswartz y Rowe (2003) revisten importancia para la educación de adultos. En cualquier lugar del mundo en que nos encontremos, el tema de la diversidad es fundamental para las clases de educación de adultos. En ellas confluyen una amplia gama de edades, un sinnúmero de creencias, percepciones, valores, visiones del mundo, al igual que las diversas experiencias de los participantes. En algunas regiones, el problema de la diversidad se ve agudizado por la reciente oleada de migración masiva, un fenómeno en el que que numerosos ciudadanos huyen de la inestabilidad política y social en sus países de origen buscando de protección y ayuda en otras naciones. Estas personas necesitarán recibir educación y capacitación en muchos niveles a medida que procuran integrarse en sus países de acogida. Asimismo, la educación de adultos suele estar asociada a iniciativas destinadas a resolver las dificultades que las personas afrontan en sus comunidades. Por ejemplo, problemas de pobreza, salud deficiente, delincuencia y violencia; desempoderamiento político; exclusión de las personas por razones de género, clase u otros factores; la necesidad de adquirir competencias laborales; y la degradación del medio ambiente. La educación cumple, por tanto, una doble función: debe conducir a una vida personal más satisfactoria y plena, pero al mismo tiempo debe contribuir a formar mejores ciudadanos y a forjar un mundo mejor. Para que esa estrategia dé resultado, los alumnos deben ser empoderados e incluidos. El entorno ideal para el aprendizaje es, por ende, un clima de mutualidad y respeto en el que los participantes se sientan valorados. Un rasgo característico de la educación de adultos es que se espera un alto grado de participación de todos los actores. Para ello es necesario que los alumnos se responsabilicen de su aprendizaje y tomen parte en un diálogo abierto y auténtico al interior de los ambientes de aprendizaje. En la sala de clases se propician las formas de comunicación positivas y la libertad para criticar y escoger, al tiempo que se fomenta la iniciativa y la autonomía de los alumnos (Barrett 2012). Teniendo en cuenta el contexto y el objetivo de la educación de adultos, quienes se dedican a esta tarea deberían gestionar activamente y valorar la diversidad observada al interior de sus espacios de aprendizaje, para así asegurarse de que los alumnos se sientan incluidos en el ambiente pedagógico. El educador de adultos ya no debe limitarse a reconocer y aceptar que cada alumno es distinto, sino que tiene que pasar a adoptar una postura que le permita crear una atmósfera de inclusión. La clave para crear un aula inclusiva que promueva la participación, el trabajo en equipo y la cohesión es una gestión de la diversidad que inste a las personas a interactuar y a compartir ideas. La competencia de los docentes para crear aulas inclusivas al gestionar la diversidad adquiere, en este caso, una importancia decisiva. Analicemos con mayor detalle una serie de estrategias que les ayudarán a los educadores de adultos a desarrollar las competencias para crear aulas inclusivas. Nuestro punto de partida es el hecho de que los educadores que adoptan una práctica reflexiva se encuentran mejor capacitados para crear aulas inclusivas donde los alumnos se sientan respetados, sus opiniones sean consideradas y, por tanto, se sientan en libertad para participar. La reflexividad se refiere a la disposición de un maestro para analizar explícitamente la manera en que sus suposiciones, sus creencias personales y sus propensiones influyen en su actitud frente a la enseñanza y los alumnos, y en su consiguiente voluntad para examinar las situaciones desde una perspectiva distinta (Barrett 2012). La reflexividad requiere que una persona considere sus actos de manera más crítica y cuestione su visión del mundo. Se centra en las presuposiciones, las conjeturas, los valores, las filosofías personales, las cosas que damos por sentadas y su efecto en nuestras relaciones. Esta forma de pensar ha sido identificada por Mezirow como una reflexión sobre una premisa, es decir, una reflexión en torno a la pregunta de por qué nos comportamos de determinada forma: “¿Cuál es la razón que explica la manera en que percibimos a otras personas y que nos obliga a formular un juicio de valor polarizado y apresurado?” (Mezirow en Welton 1995: 45). La práctica de la reflexividad supone un cuestionamiento de la relación entre nuestro yo y los demás (Cunliffe 2004). Deja al descubierto contradicciones, dudas, dilemas y posibilidades (Hardy y Palmer 1999). Debido a su especial preocupación por la autorreflexión, la reflexividad encierra un profundo potencial para producir una importante transformación personal a nivel de lo que Mezirow (1997) describe como la modificación de nuestras perspectivas de significado. La reflexividad puede ser percibida como un aspecto de un ámbito de reflexión más amplio, y como tal podría aparecer como una progresión a lo largo de un proceso continuo que va de la reflexión sobre la acción y durante la acción (Dewey 1933; Schon 1983) a la reflexión crítica (Stephen Brookfield 1995), para luego pasar a la reflexividad o el aprendizaje transformacional (Mezirow 2000). (Véase la figura 1). Una práctica reflexiva requiere que el instructor se entregue a la reflexión en diversas etapas de su práctica. En la bibliografía sobre la reflexión de los docentes se habla de reflexión antes, durante y después de la instrucción. Tanto Dewey (1933) como Schon (1983) y Laughran (2005) abordan la reflexión desde la perspectiva de la oportunidad cuando se refieren a la reflexión para la acción, la reflexión durante la acción y la reflexión sobre la acción. La reflexión sobre la acción (Dewey 1933; Schon 1983) tiene que ver con un análisis de las situaciones en forma retrospectiva y e intentando determinar cómo podrían haber ocurrido de manera distinta. Ella entraña un proceso sistemático y deliberado en el que reflexionamos sobre nuestras acciones luego de ocurrido un suceso. La reflexión durante la acción se refiere a pensar en hacer algo mientras se hace; este tipo de reflexión puede describirse como pensar sobre la marcha. Ocurre cuando una persona redefine lo que está haciendo mientras lo hace. Mezirow (1995) describió la reflexión durante la acción como un tipo momentáneo de reflexión que se emplea en una situación inmediata para guiar los próximos pasos. Un elemento clave para la reflexión durante la acción está representado por las experiencias pasadas que nos permiten reconocer el tipo de reacción que una determinada acción podría provocar, lo cual nos lleva a modificar nuestras acciones. Este tipo de reflexión puede alinearse con la noción de automanejo promovida en las obras sobre inteligencia emocional. La reflexión para la acción tiene una naturaleza anticipatoria. Alude a la reflexión que tiene lugar antes de una experiencia, y como tal puede describirse como una reflexión destinada a la acción. El centro de interés de esta forma de reflexión es la autoconciencia, otra noción fundamental propia de la inteligencia emocional. Si se pretende crear aulas inclusivas para la enseñanza de adultos, es preciso que el instructor a cargo se entregue a prácticas reflexivas antes, durante y después de la experiencia de aprendizaje. En las sociedades contemporáneas, la enseñanza se imparte en entornos complejos y diversos. En ningún ámbito resulta esto más evidente que en las clases de educación de adultos, habida cuenta de la heterogeneidad que reina en ellas. El educador puede recibir el nombre de maestro, tutor, facilitador o guía. Independientemente de la denominación de su cargo, esta persona tiene que crear y gestionar un ambiente en el aula que propicie el aprendizaje de todos los alumnos. Lo que el educador hace o deja de hacer adquiere enorme importancia al momento de facilitar el aprendizaje. Al mismo tiempo, nuestros supuestos intelectuales, nuestras creencias y nuestras emociones influyen poderosamente en la naturaleza y las consecuencias de nuestro comportamiento como profesores. Al reaccionar frente a los alumnos, los maestros lo hacen en función de sus propios pensamientos, visiones de mundo, valores y presunciones. Así pues, en algunas situaciones, “lo que pensamos que son maneras democráticas y respetuosas de tratar a la gente, pueden ser experimentadas como una situación opresiva y restrictiva por las personas afectadas” (Brookfield 1995: 1). La reflexividad proporciona una herramienta que permite a los docentes adquirir conciencia de la óptica que adoptan mientras enseñan y desde la cual ven a sus alumnos. Pero ella también funciona como un espejo que permite que el maestro se vea a sí mismo, y que explicita los aspectos tácitos o que se dan por sentados. En este proceso, el hecho de adoptar una actitud reflexiva les ayuda a los maestros a aclarar y a redefinir sus creencias, imágenes y supuestos pedagógicos, y les permite apreciar de qué manera sus conclusiones acerca de lo que ocurre en sus aulas corresponden meramente a su interpretación de esas interacciones. Gracias al proceso reflexivo, los maestros pueden integrar sus creencias profesionales y sus conocimientos teóricos para generar nuevos significados profesionales y prácticas concretas, logrando así crear y mantener aulas inclusivas y garantizar el aprendizaje de los alumnos. Village y Lucas (2002) observaron que los maestros se encuentran en mejores condiciones para establecer una comunicación más eficaz con sus alumnos cuando conocen las culturas de éstos, cuando destierran sus propios prejuicios y evitan dejarse llevar por cualquier sesgo. Por ende, la reflexividad, facilita el desarrollo de la competencia personal y social de los docentes —la inteligencia emocional— y favorece su crecimiento transformativo. Esto les ayuda a adoptar una actitud menos emocional en el aula, y a crear, de este modo, un ambiente de aprendizaje más acogedor. Para que los educadores de adultos aprendan a ser reflexivos, el primer paso es que los docentes identifiquen con claridad sus valores fundamentales, desarrollen una visión, y ajusten conscientemente sus actitudes y creencias a sus acciones y su comportamiento. Avery y Thomas (2004) advirtieron que en los cursos donde prevalecen las clases expositivas, y al mismo tiempo existe un escaso grado de interacción con los alumnos y de aprendizaje experiencial, difícilmente aumentará la conciencia sobre la diversidad. La participación activa y las iniciativas experienciales les ayudan a los alumnos a transitar desde la asimilación cognitiva de los conceptos hacia una comprensión más cabal y hacia aplicaciones prácticas. Por consiguiente, las estrategias para promover la reflexividad en los educadores de adultos que se han expuesto aquí tienen un carácter eminentemente experiencial y participativo. El fundamento teórico de las estrategias se encuentra en ideas de reflexión crítica (Freire 1995), aprendizaje transformativo (Mezirow 1997), aprendizaje experiencial (Kolb 1984; Jarvis 2010), constructivismo social (Vygotsky 1978) y práctica reflexiva (Brookfield 1995; Loughran 2005; Mezirow 1997). Se recomienda emplear las cuatro estrategias antes descritas en la capacitación de los instructores previa a la docencia, o en la capacitación durante la enseñanza. Todas ellas permiten que los instructores en período de formación participen de manera activa, ya sea individualmente o en grupos, en experiencias de aprendizaje estructurado. Estas estrategias generan experiencias de aprendizaje reales o simuladas que propician la autorreflexión o la introspección en los participantes. El objetivo no es, entonces, enseñar directamente sino permitir que los instructores, en su condición de alumnos, descubran información sobre sí mismos mediante la autorreflexión y la interacción grupal. En las siguientes secciones nos referiremos al educador de adultos en etapa de formación como “el aprendiz”, y al profesor como “el instructor”. Los diarios personales son herramientas para promover el crecimiento entre los aprendices mediante la reflexión crítica y la construcción de significados. El objetivo de un diario es que los alumnos evalúen sus acciones y reflexionen sobre la manera en que podrían manejar la situación de manera distinta en el futuro, es decir reflexionar durante la acción. Pero además propicia la reflexión para la acción, ya que el resultado del análisis influirá en las acciones futuras. El hecho de escribir un diario de reflexión proporciona un espacio seguro para expresar libremente lo que pensamos y sentimos. Les ofrece a los alumnos oportunidades guiadas para “pensar en voz alta” sobre el papel y reflexionar sobre sus propias percepciones o interpretaciones de las situaciones que se les presentan (Brown y Sorrell 1993). Los aprendices son capaces de explicar por qué se adoptaron ciertas decisiones o se tomaron determinadas medidas, al igual que de describir los sentimientos, las reflexiones y orientaciones para el futuro. Como estrategia para inculcar la reflexividad, los aprendices tendrán que documentar situaciones en las que recuerden haber sido cuestionados por un alumno que pensara distinto o que se sintiera incómodo o disgustado al interior del espacio de aprendizaje. Se les pedirá que analicen sus reacciones frente a esas situaciones. Posteriormente, el instructor le formulará de manera personalizada a cada aprendiz comentarios y sugerencias sobre su anotación en el diario personal. Estas observaciones deben estar exentas de juicios y críticas. Por el contrario, tienen que servir para instar al aprendiz a reflexionar sobre sus experiencias, y para impulsarlo a meditar más profundamente respecto de sus suposiciones, presunciones y creencias sobre sí mismo, sus alumnos y el ambiente de aprendizaje. Entre otras iniciativas, hay que acicatear a los aprendices para que se pregunten continuamente por qué tomaron una determinada decisión o por qué un tema o un acontecimiento les produjo una determinada impresión. Para que sea eficaz, el proceso de escribir en el diario debe ser adecuadamente planificado y los alumnos deben tener claras sus expectativas. Por añadidura, los aprendices tendrán que poseer una mentalidad abierta y estar dispuestos a asumir la responsabilidad de sus actos en los diversos incidentes que se registren. El objetivo en este caso consiste en exponer los sesgos, los prejuicios y las inquietudes personales. La eficacia de este enfoque reside en la disposición de los aprendices a reconsiderar sus suposiciones y a someterlas a un proceso continuo de cuestionamiento, argumentación y contraargumentación. El educador de adultos en proceso de formación también tiene que ser objetivo al exponer y evaluar los razonamientos que sustentan su postura, y al revisar las evidencias y los argumentos a favor y en contra de una determinada aseveración polémica. Lo que se pretende en este caso no es llegar a un consenso, sino más bien ayudarles a lograr percibir el problema desde una dimensión más crítica; conseguir que adquieran un mayor grado de autoconciencia y mejorar su capacidad de autocrítica; ayudarles a los aprendices a reconocer e investigar sus suposiciones; fomentar en ellos la valoración de la diversidad de opiniones y de las perspectivas que surgen en el contexto de un debate abierto y franco; inculcarles la capacidad para escuchar de manera atenta y respetuosa; y ayudarles a tomar decisiones informadas (Brookfield y Preskill 1999). El instructor planteará un caso polémico derivado de una situación ficticia o de la vida real relativa a un aspecto propio de la diversidad. Posteriormente, el instructor moderará un debate abierto sobre el tema. Se recomendará a los aprendices que sean objetivos al exponer sus argumentos, y que estén dispuestos a analizar la evidencia y los argumentos aportados por sus compañeros a favor o en contra del tema en discusión. Mediante el debate crítico, los aprendices van a tomar conciencia de sus suposiciones y perspectivas sobre el tema analizado, y de cómo ellas pueden diferir de las expuestas por los demás participantes. El uso de situaciones hipotéticas y del juego de rol también puede ser una herramienta valiosa para propiciar el desarrollo de la reflexividad en los educadores de adultos. Por lo general, el juego de rol acelera la adquisición de conocimientos, competencias y actitudes, al concentrarse en la participación activa y en la sensibilización frente a nuevos comportamientos y funciones que asumen las personas. La oportunidad de involucrarse en situaciones similares a las de la vida real les ayuda a los aprendices a practicar y a retener información, y además les permite transferir conocimientos y competencias a situaciones propias de la vida cotidiana (Dawson, s.f.). El hecho de poner en contacto a los aprendices con situaciones hipotéticas, pero realistas, asociadas a la diversidad, les servirá para llegar a percibir la complejidad de los problemas relativos a la diversidad al adoptar el punto de vista de otra persona. El juego de rol también puede emplearse para que los aprendices demuestren cómo reaccionarían frente a una situación determinada, y evalúen los motivos para proceder de esa manera. En el aula, a los aprendices se les plantean situaciones hipotéticas propias de la vida real en las que surge un problema en la sala de clases, y se les pide que representen el episodio demostrando cómo reaccionarían ante el problema implícito. Tras el juego de rol, el instructor moderará un debate sobre la situación representada por los aprendices y las decisiones que adoptaron para afrontar la dificultad. Este proceso de reflexión ofrece otra vía hacia el autoconocimiento y la reflexión para la acción. Esta estrategia posee una naturaleza similar a la del debate grupal que acabamos de analizar. Ello porque el caso en cuestión por lo general sirve de catalizador para un debate grupal abierto. Los estudios de casos resultan útiles para ayudarles a las personas a analizar los valores que sustentan respecto de diversos problemas sociales que afectan a muchas personas e involucran puntos de vista divergentes. Los estudios de casos se utilizan para exponer las distintas maneras de pensar sobre un mismo tema. Como estrategia para fomentar la reflexividad, el instructor seleccionará, ya sea de manera independiente o en colaboración con los aprendices, casos basados en situaciones reales que reflejen situaciones de diversidad. Se les pedirá a los aprendices que lean el caso y que cada uno señale cómo reaccionaría personalmente. Luego el instructor moderará un debate en torno al caso, durante el cual los aprendices tendrán la oportunidad de compartir sus perspectivas sobre el particular. La discusión sobre el caso permite que los aprendices den a conocer —y luego analicen— el punto de vista que adoptarían frente a numerosos problemas relativos a la diversidad. También les ayuda a aclarar sus creencias, suposiciones, sesgos y contradicciones. El mundo contemporáneo se caracteriza por la internacionalización, la globalización y tasas de inmigración cada vez mayores. Como consecuencia de lo anterior, el tema de la diversidad ha adquirido mayor importancia al interior de nuestras sociedades y, en gran medida, en nuestros espacios de aprendizaje. Es menester que los educadores de adultos desarrollen habilidades y competencias que les permitan gestionar la diversidad en sus aulas y crear, asimismo, un ambiente de aprendizaje donde todos los alumnos se sientan respetados y, por tanto, estén dispuestos a participar. El educador de adultos tiene que llegar a valorar la necesidad de analizar constantemente sus suposiciones, sus creencias personales, y sus predisposiciones, y de adquirir mayor conciencia de la manera en que los consiguientes comportamientos y actitudes se manifiestan en sus clases. Con ello el educador se encontrará en mejores condiciones para crear y mantener aulas más inclusivas. Avery, D. R. & Thomas, K. M. (2004): Blending content and contact: The roles of diversity curriculum and campus heterogeneity in fostering diversity management competency. Academy of Management Learning & Education, 3(4), 380-396. Barrett, S. (2012): Teaching beyond the technical paradigm: A holistic approach to tertiary professional education. En: Journal of Education and Development in the Caribbean, 14(2), 1-18. Brookfield, S. D. (1995): Becoming a critically reflective teacher. San Francisco, CA: Jossey- Bass Publishers..
Brookfield, S. D. & Preskill, S. (2005): Discussion as a way of teaching: Tools and techniques for democratic classrooms (2a ed.). San Francisco, CA: Jossey-Bass Publishers. Brown, H. N. & Sorrell, J. M. (1993): Use of clinical journals to enhance critical thinking. In: Nurse Educator, 18(5), 16-19. Cunliffe, A. (2004): On becoming a critically reflexive practitioner. En: Journal of Management Education, 28(4), 407- 426. Darkenwald, G. G. & Merriam, S. B. (1982): Adult Education: Foundations of Practice. Nueva York, NY: Harper and Row. Davies, E. (1995): Reflective practice: a focus for caring. En: Journal of Nursing Education, 34(4), 167–174. Dawson, G. A. (s.f. ): Integrating emotional intelligence training into teaching diversity. Business Quest. Dewey, J. (1933): How we think. Nueva York, NY: Heath and Co.
Hardy, C. & Palmer, I. (1999): Pedagogical practice and postmodernist ideas. En: Journal of Management Education. 23 (4), 377-395. Kolb, D. A. (1984): Experiential Learning. Nueva Jersey, NJ: Prentice Hall. Laughran, J. (2005): Developing reflective practice: Learning about teaching and learning through modeling. Londres, Inglaterra: RoutledgeFalmer. Mezirow, J. (1995): Transformation theory of adult learning. En: Welton, M. (Ed. ): In defense of the lifeworld: Critical perspectives on adult learning. 39-70. Albany, NY: State University of New York Press. Schon, D. A. (1983): The reflective practitioner: How professionals think in action. Nueva York NY: Basic Books. Villegas, A. M. & Lucas, T. (2002): Preparing culturally responsive teachers: Rethinking the curriculum. En: Journal of Teacher Education, 53 (1), 20 – 32. Shermaine Barrettest maître de conférences à l’université de technologie de Jamaïque. Actuellement, elle est vice-présidente du Conseil international pour l’éducation des adultes (CIEA) pour la région caribéenne. Ses recherches portent, entre autres, sur l’enseignement destiné aux adultes, l’apprentissage des adultes, l’éducation de la main-d’œuvre et le développement professionnel des enseignants. Résumé – Comment pouvons-nous renforcer les capacités des éducateurs d’adultes afin de créer des classes inclusives dans un environnement estudiantin caractérisé par la diversité ? Cet article décrit dans ses grandes lignes un processus par lequel les éducateurs d’adultes peuvent développer une meilleure compréhension d’eux-mêmes en ce qui concerne leurs valeurs, leurs vues morales, leurs partis pris et leurs préjugés, et avoir les moyens d’identifier comment ces traits influencent l’interaction avec leurs étudiants. Il part du principe que la réflexivité, la volonté de réfléchir sur soi, permet à l’enseignant d’atteindre une connaissance de lui-même conduisant à une meilleure gestion de sa personne et de la situation, ce qui permet d’être mieux outillé pour créer un environnement d’apprentissage inclusif. Nous vivons dans un monde globalisé en mutation permanente et connecté, où la diversité est par conséquent devenue un sujet brûlant dans les domaines de la politique, de la loi, de l’entreprise et de l’éducation. En tant que concept, elle admet que les gens sont différents de maintes façons, parfois visibles, parfois invisibles. Les exemples typiques à ce sujet sont l’âge, le sexe, la situation de famille, la position sociale, le handicap, l’orientation sexuelle, la religion, la personnalité, l’ethnicité et la culture. Gardenswatz et Rowe (2003) répartissent les dimensions multiples de la diversité en catégories, dans un modèle dit des quatre dimensions de la diversité. Dans ce modèle, les quatre dimensions sont représentées par des cercles concentriques. En partant du centre vers l’extérieur, ces strates se composent de la personnalité au centre, des dimensions internes dans le second cercle, des dimensions externes dans le troisième et, enfin, des dimensions organisationnelles dans le quatrième qui constitue la périphérie. La dimension de la personnalité correspond au style personnel et aux traits de caractère des individus, indiquant si cette personne est introvertie ou extrovertie, pensive ou expressive, si elle pense ou si elle agit. La seconde strate, les dimensions internes, correspond aux caractéristiques que l’individu ne contrôle pas. Elles incluent des caractéristiques comme le sexe, l’âge, la race, l’orientation sexuelle, l’ethnicité et l’aptitude physique. La troisième strate, les dimensions extérieures, englobe les aspects qui sont le fruit des expériences et des choix de vie comme la religion, l’instruction, l’expérience professionnelle, la situation maritale, la situation de famille, les loisirs, la localisation géographique et les revenus. La quatrième strate, la dimension organisationnelle, se compose de caractéristiques comme le domaine et la situation professionnels, l’affiliation à un syndicat, l’ancienneté, le lieu de travail, le département et la classification professionnelle. Les caractéristiques de la diversité dans ce cercle relèvent du contrôle de l’entreprise au sein de laquelle la personne travaille. Toutes les dimensions abordées par Gardenswartz et Rowe (2003) sont importantes dans l’éducation des adultes. Où que nous soyons dans le monde, la diversité est une question centrale dans les classes composées d’adultes. Les classes de ce type rassemblent des personnes d’âges divers, des multitudes de croyances, de conceptions, de valeurs et de façons de voir le monde, et les vécus divers des participants. Dans certaines régions, la question de la diversité a été rendue encore plus complexe par la récente déferlante migratoire de personnes fuyant des troubles politiques et sociaux dans leurs patries et cherchant protection et aide dans d’autres pays. Ces gens vont avoir besoin de l’éducation et de la formation à de nombreux niveaux pour s’intégrer dans leurs pays hôtes. L’éducation des adultes est aussi associée d’habitude à des efforts entrepris pour aborder des problèmes auxquels les gens se trouvent confrontés dans leurs communautés comme, par exemple, la pauvreté, la mauvaise santé, le crime et la violence, l’impuissance politique, l’exclusion des individus en raison du genre, de la classe sociale et d’autres facteurs, la nécessité d’acquérir des compétences professionnelles et la dégradation de l’environnement. Par conséquent, l’éducation a un double rôle à jouer : elle devrait conduire à une vie personnelle plus épanouissante et améliorer en même temps la citoyenneté et le monde. Les apprenants ont besoin pour que cela fonctionne qu’on leur en donne les moyens et qu’on les inclue. L’apprentissage est par conséquent facilité le mieux dans un contexte de réciprocité et de respect dans lequel les participants se sentent appréciés. Le fait que l’on attende un degré élevé de participation de la part de tous est caractéristique de l’éducation des adultes. Ainsi attend-on des apprenants qu’ils assument la responsabilité de leur apprentissage et engagent un dialogue ouvert et authentique dans les cadres d’apprentissage. En classe, des formes saines de communication ainsi que la liberté de critiquer et de choisir sont facilitées et l’initiative et l’autonomie des apprenants encouragées (Barrett 2012). Eu égard au contexte et à l’objectif de l’éducation des adultes, les éducateurs devraient activement gérer et apprécier la diversité au sein des espaces d’enseignement pour assurer que les apprenants se sentent inclus dans leur environnement d’apprentissage. L’éducateur d’adultes doit cesser d’admettre et d’accepter simplement que les apprenants sont différents les uns des autres pour créer une atmosphère d’inclusion. L’essentiel pour créer une classe inclusive qui encourage la participation, le travail d’équipe et la cohésion est de pratiquer une gestion de la diversité qui incite les personnes à interagir et à partager des idées. L’aptitude d’un enseignant à créer une classe inclusive grâce à la gestion de la diversité est d’une importance capitale ici. Penchons-nous à présent sur un certain nombre de stratégies qui aideront les éducateurs d’adultes à acquérir les compétences nécessaires pour créer des classes inclusives. Nous partons du fait que les éducateurs qui développent une pratique réflexive sont les mieux outillés pour créer des classes inclusives dans lesquelles les participants sentent que leur personne et leurs points de vue sont respectés, ce qui leur donne par conséquent le sentiment d’être libres de participer. La réflexivité correspond à la volonté de l’enseignant de réfléchir explicitement sur la façon dont ses assomptions, croyances personnelles et dispositions influent sur son attitude vis-à-vis de l’enseignement et de ses élèves, et, de là aussi, à sa détermination à envisager les choses sous un angle différent (Barrett 2012). La réflexivité exige que l’individu porte un regard plus critique sur ses actions et remette en question sa perception du monde. Elle attire l’attention sur les présupposés, les assomptions, les valeurs, les philosophies personnelles, les choses que nous tenons pour acquises et leur influence sur nos rapports avec les autres. Mezirow identifie cette forme de réflexion comme une réflexion sur les antécédents, c’est-à-dire une réflexion sur la raison pour laquelle nous nous comportons tel que nous le faisons : « Qu’est-ce qui nous pousse dans la manière dont nous voyons les autres à porter des jugements de valeur sommaires, polarisés » (Mezirow à Welton 1995 : 45). La pratique de la réflexivité englobe une remise en question de notre rapport avec les autres (Cunliffe 2004). Elle dévoile des contradictions, des doutes, des dilemmes et des possibilités (Hardy & Palmer 1999). La réflexivité avec son approche principalement axée sur la réflexion sur soi recèle un important potentiel de transformation personnelle majeure en ce qui concerne ce que Mezirow (1997) qualifie de transformation des perspectives de sens. La réflexivité peut être considérée comme un aspect d’un domaine de réflexion plus vaste et, en tant que tel, comme une progression le long d’un continuum (cf. figure 1) allant de la réflexion sur l’action et dans l’action (Dewey 1933 ; Schon 1983) vers la réflexion critique (Stephen Brookfield 1995), puis vers la réflexivité ou l’apprentissage transformationnel (Mezirow 2000). Une pratique réflexive exige que l’enseignant entreprenne un travail de réflexion à des stades divers de son activité. Les ouvrages sur la réflexion de l’enseignant parlent d’une réflexion avant, pendant et après l’enseignement. Dewey (1933), Schon (1983) et Laughran (2005) s’expriment tous au sujet de la réflexion du point de vue du moment choisi lorsqu’ils font référence à une réflexion en tant que réflexion pour l’action, réflexion dans l’action et réflexion sur l’action. La réflexion sur l’action (Dewey 1933 ; Schon 1983) s’applique à l’examen rétrospectif de situation et à l’effort entrepris pour trouver comment procéder autrement. Elle nécessite un processus systématique et délibéré de réflexion sur ses propres actions après un évènement. La réflexion en action fait référence à la réflexion sur une action en cours. On peut décrire ce type de réflexion comme une réflexion debout. Elle survient quand un individu modifie ce qu’il fait tout en le faisant. Mezirow (1995) a décrit la réflexion en action comme le type de réflexion momentané utilisé dans une situation immédiate pour guider les étapes suivantes. Les expériences passées permettant à quelqu’un de déterminer le type de réaction qu’une action particulière nécessitera probablement, conduisant à une modification des actions de cette personne, sont essentielles dans la réflexion en action. Ce type de réflexion peut être placé sur le même pied que la notion de gestion personnelle dont les ouvrages sur l’intelligence émotionnelle font la promotion. La réflexion pour l’action est anticipatrice. Elle fait référence à une réflexion qui se déroule préalablement à une expérience et peut, par conséquent, être décrite comme une réflexion pour l’action. Cette forme de réflexion est axée sur la conscience de soi, une autre notion centrale de l’intelligence émotionnelle. Créer des classes d’adultes inclusives nécessite de l’enseignant qu’il se livre à des activités de réflexion avant, pendant et après qu’il enseigne. Dans les sociétés contemporaines, l’enseignement se déroule dans des cadres complexes et divers. Cette constatation n’est nulle part plus juste que dans une classe d’adultes, eu égard à l’hétérogénéité des apprenants dans ces types de cours. L’éducateur peut être appelé professeur, tuteur, animateur ou guide. Quel que soit le titre qu’on lui donne, il doit créer et gérer dans sa classe un cadre qui facilite l’apprentissage pour tous les étudiants. Ce que l’éducateur fait ou ne fait pas est d’une grande importance pour faciliter l’apprentissage. En même temps, la nature et les résultats de nos comportements d’enseignants sont largement influencés par nos assomptions intellectuelles, nos croyances et nos émotions. Les enseignants répondent aux étudiants en s’appuyant sur leurs pensées, leur vision du monde, leurs valeurs et leurs assomptions. Par conséquent, parfois « ce que nous pensons être des façons démocratiques et respectueuses de traiter les gens peut être ressenti par ces personnes comme accablant et contraignant » (Brookfield 1995 : 1). La réflexivité procure un outil qui fait prendre conscience aux enseignants de la lorgnette par laquelle ils regardent et voient leur classe lorsqu’ils enseignent. Elle agit toutefois aussi comme un miroir qui leur permet de se voir eux-mêmes et d’expliciter ce qui est tacite ou considéré comme acquis. Ce faisant, pratiquer la réflexivité aide les enseignants à déterminer et redéfinir leurs croyances éducatives, leurs images et leurs suppositions, et leur permet de voir dans quelle mesure les conclusions qu’ils tirent au sujet d’évènements dans leur classe sont en réalité juste leur interprétation de telles interactions. Le processus de réflexion permet aux enseignants d’intégrer leurs croyances professionnelles et leurs connaissances théoriques dans de nouvelles significations et pratiques professionnelles concrètes au profit de la création et du maintien de classes inclusives, et de l’apprentissage des étudiants. Village et Lucas (2002) ont observé que les enseignants étaient plus en mesure d’établir une communication plus efficace avec leurs étudiants quand ils connaissent la culture de ces derniers, remettent en question leurs propre préjugés et se comportent impartialement. Par conséquent, la réflexivité facilite le développement des compétences personnelles et sociales – l’intelligence émotionnelle – de l’enseignant et favorise son développement transformateur. Ceci aide l’enseignant à être moins émotionnel en classe, et à créer ainsi un cadre plus favorable à l’apprentissage. Pour apprendre aux éducateurs d’adultes à être réflexifs, il faut d’abord qu’ils éclaircissent leurs valeurs fondamentales en développant une vision et en alignant consciemment leurs attitudes et croyances sur leurs actions et comportements. Avery et Thomas (2004) ont remarqué que les cours donnés selon une approche essentiellement magistrale et ne laissant que peu d’espace à l’interaction avec les apprenants et à l’apprentissage expérientiel ont peu de chances d’accroître la sensibilisation à la diversité. Les efforts actifs et les activités basées sur l’expérience aident les apprenants à passer de la connaissance cognitive de concepts à une compréhension plus profonde et à une mise en pratique. Par conséquent, les stratégies présentées ici et dont l’objectif est de promouvoir la réflexivité auprès des éducateurs d’adultes reposent fondamentalement sur une approche expérientielle et participative. Elles sont théoriquement ancrées dans les idées de la réflexion critique (Freire 1995), de l’apprentissage transformationnel (Mezirow 1997), de l’apprentissage expérientiel (Kolb 1984 ; Jarvis 2010), du constructivisme social (Vygotsky 1978) et de la pratique de la réflexivité (Brookfield 1995 ; Loughran 2005 ; Mezirow 1997). Il est recommandé d’employer les quatre stratégies présentées soit pour former les enseignants avant leur entrée en activité, soit dans un contexte de formation continue. Toutes ces stratégies permettent aux enseignants en formation de participer activement à des expériences d’apprentissage structurées, que ce soit individuellement ou en groupes. En outre, elles mettent en œuvre des expériences d’apprentissage dans un cadre réel ou simulé en vue de faciliter la réflexion sur soi/l’introspection des individus. L’objectif n’est pas par conséquent directement d’enseigner mais de permettre aux enseignants dans ce rôle d’apprenants de découvrir des choses sur eux-mêmes par le biais de la réflexion sur soi et de l’interaction avec le groupe. Dans les parties suivantes, l’éducateur d’adultes en formation sera appelé stagiaire et l’enseignant instructeur. Les journaux sont des outils de promotion pour l’évolution des stagiaires par le biais de la réflexion critique et de la recherche de sens. La rédaction d’un journal a pour but de permettre aux stagiaires d’évaluer leurs actions et de réfléchir à la façon dont ils pourraient à l’avenir gérer la situation différemment ; c’est ce qu’on appelle la réflexion sur l’action. Cette approche facilite toutefois aussi la réflexion, et le résultat de l’analyse entrera en ligne de compte dans leurs actions futures. Rédiger un journal offre un espace pour exprimer librement ses pensées et sentiments. Tenir un journal réflexif permet à l’apprenant de « penser tout haut » sur papier et de réfléchir sur leur propre perception ou compréhension des situations rencontrées (Brown et Sorrell 1993). Les stagiaires sont ainsi capables d’exprimer pourquoi ils ont pris des décisions et entrepris des actions, et de décrire des sentiments ainsi que de futures réflexions et directions. Une stratégie d’enseignement de la réflexivité consiste à demander aux stagiaires de faire un relevé des incidents dont ils se souviennent : une difficulté posée par un étudiant ou par un point de vue différent du leur, ou un sentiment de malaise ou de colère dans le lieu d’enseignement. On leur demande ensuite d’analyser leurs réactions dans ces situations. L’instructeur donne ensuite aux stagiaires une appréciation individuelle de ce qu’ils ont écrit dans le journal. Cette appréciation ne doit porter aucun jugement et être dépourvue de critique. Elle doit plutôt servir à inciter le stagiaire à réfléchir sur ses propres expériences et le pousser à examiner davantage en profondeur le niveau auquel se situent les assomptions, les présupposés et les croyances à son sujet, au sujet de ses apprenants et concernant l’espace d’apprentissage. Cette démarche implique aussi de pousser les stagiaires à se demander constamment pourquoi ils ont pris une décision ou pourquoi ils éprouvent certaines choses à propos d’un sujet ou d’une situation particuliers. Pour être efficace, la tenue d’un journal doit être bien planifiée et avoir des attentes explicites vis-à-vis des stagiaires. En outre, ces derniers doivent faire preuve d’ouverture d’esprit et d’une volonté d’assumer la responsabilité de leurs actions concernant les différents incidents enregistrés. Le but de cette approche consiste à dévoiler les partis pris, les préjugés et les préoccupations personnelles. Son efficacité repose sur la volonté des stagiaires d’accepter de revoir leurs présupposés, de les remettre constamment en question et d’argumenter pour et contre eux. L’éducateur d’adultes en formation doit aussi être objectif lorsqu’il présente et évalue les raisons de ses prises de positions et lorsqu’il examine les preuves et arguments pour ou contre l’affirmation problématique en question. Il ne s’agit pas ici d’obtenir un consensus mais plutôt d’aider les stagiaires à avoir un point de vue plus critique du problème ; à améliorer leur conscience d’eux-mêmes et leur capacité à l’autocritique ; à reconnaître et à examiner leurs assomptions ; à favoriser, chez eux, l’estime de la diversité d’opinions et de points de vue émergeant dans le contexte d’une discussion ouverte et honnête ; à encourager une écoute attentive et respectueuse ; enfin, à aider les individus à prendre des décisions éclairées (Brookfield et Preskill 1999). Pour cela, l’instructeur met en avant une déclaration problématique prise dans une situation réelle ou fictive, en rapport avec une facette de la diversité. Il anime ensuite une discussion ouverte sur la question. Puis, il encourage les stagiaires à présenter objectivement leurs arguments et à accepter d’examiner les preuves et arguments des autres stagiaires pour ou contre la déclaration au cœur de la discussion. Par le biais de cette discussion critique, les stagiaires prennent conscience de leurs assomptions et points de vue sur la question débattue et sur la mesure dans laquelle ils peuvent différer de ceux des autres. Il peut aussi être utile de faire appel à des scénarios et des jeux de rôles pour faciliter le développement de la réflexivité chez les éducateurs d’adultes. En général, les jeux de rôles permettent d’acquérir plus rapidement des connaissances, des compétences et des attitudes en se concentrant sur la participation active et la sensibilisation aux rôles et comportements nouveaux. La possibilité de jouer des situations qui ressemblent à celles qu’ils peuvent rencontrer dans l’existence aide les stagiaires à s’entraîner et à retenir des informations, et leur permet d’appliquer des connaissances et compétences à la vie quotidienne (Dawson, n. d.). Présenter aux stagiaires des scénarios réalistes de la diversité les aidera à développer une compréhension de la complexité des questions qui y sont liées en se plaçant du point de vue d’un autre. Les jeux de rôles peuvent aussi être utilisés pour que les stagiaires montrent comment ils réagiraient dans une situation donnée et afin qu’ils évaluent les raisons de telles réactions. En classe, on leur présente des scénarios réels, dépeignant des problèmes survenant durant les cours et on leur demande de mimer la situation en répondant à sa difficulté. Après le jeu de rôles, l’instructeur anime une discussion sur ce que les stagiaires ont joué et les décisions qu’ils ont prises pour s’attaquer au problème. Ce processus de réflexion offre une autre possibilité de connaissance de soi, de réflexion pour l’action. Cette stratégie est proche de par sa nature de la discussion de groupe que nous avons abordée un peu plus tôt. C’est généralement dû au fait que le cas étudié sert généralement de catalyseur pour une discussion de groupe. Les études de cas sont utiles pour aider les individus à analyser leurs valeurs sur différentes questions sociales en rassemblant beaucoup de monde et de points de vue divers. On les utilise pour démontrer différentes façon d’envisager une même question. Comme stratégie pour encourager à la réflexivité, l’instructeur choisit des cas pris dans de vraies situations, soit indépendamment, soit en collaboration avec les stagiaires, et illustrant des scénarios de diversité. Les stagiaires doivent ensuite lire le cas et formuler individuellement leur réponse personnelle. Puis, l’instructeur anime une discussion sur le cas tandis que les stagiaires ont la possibilité de partager leurs points de vue sur la question. Cette discussion permet aux stagiaires de s’exprimer et de réfléchir sur la lorgnette par laquelle ils voient les différentes questions liées à la diversité. Elle les aides aussi à tirer au clair leurs croyances, leurs assomptions, leurs partis pris et leurs contradictions. Le monde d’aujourd’hui est caractérisé par l’internationalisation, la globalisation et des niveaux d’immigration accrus. Il en résulte que la question de la diversité a pris de l’importance dans nos sociétés et, essentiellement, dans nos espaces d’apprentissage. Les éducateurs d’adultes doivent acquérir des aptitudes et compétences pour gérer la diversité dans leurs salles de classe et créer un cadre d’apprentissage à l’intérieur duquel tous les apprenants se sentent respectés et soient par conséquent enclins à participer. Ils doivent apprendre à évaluer la nécessité d’examiner constamment leurs assomptions, leurs croyances personnelles et leurs dispositions, et à être davantage sensibilisés à la façon dont les comportements et attitudes qui en résultent se répercutent sur leurs cours. Ceci permet aux éducateurs d’être mieux outillés pour créer et maintenir des classes plus inclusives. Freire, P. (1995) : Pedagogy of hope. New York, NY : The Continuum Publishing. Hardy, C. et Palmer, I. (1999) : Pedagogical practice and postmodernist ideas. Dans : Journal of Management Education, 23 (4), 377-395. Jarvis, P. (2010) : Adult Education and Lifelong Learning: Theory and Practice (4e éd.). Oxon, OX : Routledge. Kolb, D. A. (1984) : Experiential Learning. New Jersey, NJ : Prentice Hall. Laughran, J. (2005) : Developing reflective practice: Learning about teaching and learning through modeling. Londres, Angleterre : Routledge/Falmer. Mezirow, J. (1995) : Transformation theory of adult learning. Dans : Welton, M. (éd.) : In defense of the lifeworld: Critical perspectives on adult learning, 39-70. Albany, NY : State University of New York Press. Mezirow, J. (1997) : Transformative Learning: Theory to Practice. Dans : New Directions for Adult and Continuing Education, 74, 5-12. Schon, D. A. (1983) : The reflective practitioner: How professionals think in action. New York, NY : Basic Books. Villegas, A. M. et Lucas, T. (2002) : Preparing culturally responsive teachers: Rethinking the curriculum. Dans : Journal of Teacher Education, 53(1), 20-32. Vygotsky, L. S. (1978) : Mind in society: The development of higher psychological processes. Cambridge, MA : Harvard University Press. Follow the ICAE Virtual Seminar also here. Many more thanks to the Author. I found the article a rewarding learning experience.